Wednesday left for Gréolières, one of those great flying sites in the Gourdon area, in the South-East corner of France. Harri Seppi and I will guide and teach a group of 8 pilots there later this month. I decided to turn the trip into a long vacation and drive down there, all the way from my home in Espoo, Finland. With the idea of flying in many places along the way, going along with the weather. So on Wednesday tried to get a few pilots to go and fly in Kiikala, which is on the way to Turku, from where I had to take the Viking Line ferry to Stockholm in the evening. Alas, nobody could come to Kiikala but we got some some airtime at the Hyvinkää airfield. I left early, didn't want to miss the boat! In Turku then had a couple of hours, so went for a walk and some food in the sunny downtown. I bumped into the new public library,and went inside to look at this new building, famous for its architecture. It was actually quite impressive, very nice indeed. As all good architecture it was interesting at various scales. 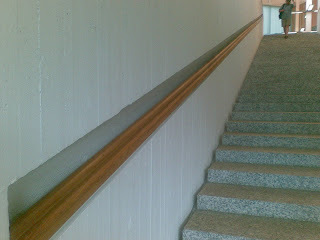 Above a picture of the embedded handrail of the main stairs. The same wood and coloring was used throughout the building. I had tea in the nice CafeArt and then hurried to the ferry. 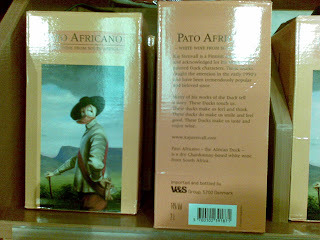 Where the art theme continued when in the taxfree shop noticed South African wine boxed in packaging with a Kaj Stenvall duck painting! And no, I didn't buy or drink any, what's the point of buying wine when going to France? The next morning Stockholm welcomed me with a dark cloudy sky and along the way south I encountered a couple of very severe storms. Further south there were some sunny spells but the winds were very strong so decided to take a deep breath and continued all the way to my relatives in Dronten, the Netherlands. Looks like flying will have to wait till Sunday or Monday, when I plan to be around Annecy. Have fun in Annecy and in Greolieres! I'm sitting on the porch in Margarets house (yes, I found wireless internet when I walked in the house with the computer in my hands). Everything's still good, went to church today and then ate some cookie dough ice cream with Yura. Tomorrow we'll go to school to select classes and then I'll try out for the cheerleading team. goede vluchten! ik schrijv wel een e-mail later.